The war chest of a global strategist is bestowed with varied innovative growth strategy arsenal to win and conquer the global battles of business. This article captures a dozen lessons that deserve attention in strategy development. As a strategist your innovation is to embrace one or a combination thereof to succeed. Innovation, sans jargon, simply means ‘doing things better’. Innovation is not invention. Henry Ford did not invent the car (Karl Benz did!). His innovation was the assembly line. As a result, one Model T came off the line every three minutes thereby reducing overall production time by a factor of eight; from 12.5 hours to just 93 minutes. By 1914, with streamlined assembly processes, Ford could make more cars than all other automakers combined, each at a much lower cost. Innovation is not just technology. It’s rethinking business! Henry Ford saw the “business opportunity” of meeting huge unmet demand for cars through the innovative assembly line process. Simply put, innovation is not just invention or product development. It is just doing things better. Innovation is multifaceted and can take varied forms. It could be through the invention of new technologies and products, it could be more efficient and effective supply chains, better customer service, experience and engagement, better product designs and renovations or better solutions through integration of ideas across business processes. Business Model Innovation is finding new and better ways to create value for customers and extracting value for firms as well as their business partners such as distributers and suppliers. Value creation requires investments in assets and capabilities that can be leveraged to provide better customer solutions and simultaneously provide sustainable competitive advantages. Value extraction includes the pathway to profitability. Toyota, a generalist, has focused on competitive advantages through economies of scale. Its business model relies on higher volumes (market share) and much lower margins compared to Porsche which focuses on product differentiation and branding. Value extraction strategies also require balancing and/or trading off between profitability, growth and risk. A company may forgo short term profitability to grow market share that, if defendable, can provide higher levels of longer term profits. It can reduce risks by enhancing customer experience and engagement or through product innovation and differentiation. This balancing act is a matter of strategy. Business Model Innovations require finding new and better ways of creating and extracting value. Uber and Airbnb “outsource” tangible assets (car and home ownership) and focus on managing relations with two types of customers (vendors and users of services) by investing in technology to enable relationship management. Their “return on assets” (ROA) can therefore be higher as they are “asset poor” when it comes to investments in tangible assets such as cars and homes. But, they are rich in intangible assets (customers, brands, intellectual property) which are not represented on the balance sheet. Ingraining an ‘organisational capability’ for innovation in creation of value is indispensable while competing in global markets. The basic questions underlying value creation are: who – which segments to serve (or not serve); what product or service to globalise; how to serve them through appropriate supply chains, channels and market-based assets, or organisational capabilities; and finally where (which geographical markets) to serve. Once firms are clear on the value proposition, they may delve on any of the below suitable strategies (lessons so to say!) in isolation of other strategies or a combination thereof. These strategies are generic and not prescriptive. They are, however, routinely observed and often implemented by resource-endowed firms. Taking the automobile industry as an example, Henry Ford’s focus on productivity led to a business model where the competitive advantage of lower costs and prices resulted in greater market share and, subsequently, even greater economies of scale. But, these advantages dissipated over time as other manufacturers adopted assembly lines and like Alfred Sloan, the founder of General Motors, moved the automotive market competition from cost/price minimisation to differentiation and branding. It was no longer enough to have any car as long as it was a black Model T Ford. Customers could start with a Chevrolet, get an Oldsmobile as families grew and income increased, migrate further to a stylish Buick, and finally to a Cadillac when one foot was in the grave. This use of differentiation and branding allowed GM to capture higher prices and margins as customers moved through their lifecycle but collapsed decades later when in the name of efficiency and cost management GM used the same chassis (platform) across Chevy, Olds and Buicks. In effect their new business model failed to understand what made GM great in the first place. 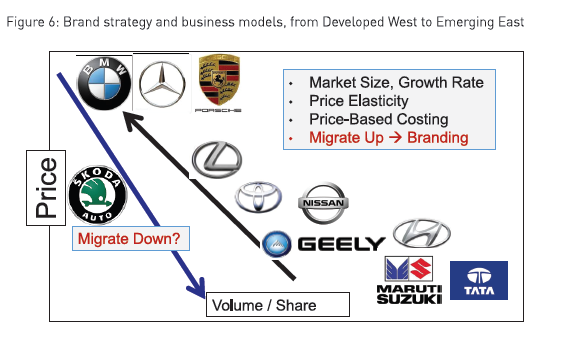 European companies such as BMW and Daimler-Benz, not having the same scale as the US market, relied on product performance and premium pricing. The Japanese, who were late entrants in the global market, focused on longevity (reliability and quality) to deliver value and eventually solutions such as service guarantees and extended warranties to enhance customer switching costs and loyalty. 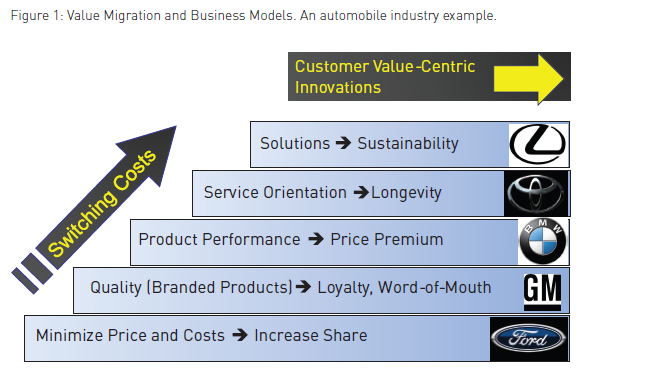 These business model innovations evolved over decades in the automotive market (See Figure1). But they now occur over but a few months in consumer electronics sectors such as the smartphone market. Failure to innovate – to do things better – is a free gate pass to exit. Back to the core: what is value and how do firms create value? Simply put, anything that offers benefit is value and different firms are the sources of different value. For instance firms like Intel, GSK, and Boeing create value on technology, research and engineering dimensions. If one looks at Dell, Indigo or Flipkart their “corporate DNA” relies on efficiency and speed as the major determinants of value. Other firms like Coke, Microsoft Windows, Google and Porsche rely on customer experience, aspiration and sheer hedonistic brand appeal as value drivers in the marketplace – even though each of them spends loads of money on R&D. Some firms are endowed with the ability to perform on several dimensions. Apple is known for its aesthetic capabilities (designed in California), works with Foxconn, the world’s biggest contract manufacturer (Made in Taiwan), is focused on efficiency; and known for its expertise in managing customer experience and mastery over branding (See Figure 2). Here the value creation is due to innovation on all three dimensions; renovation and integration brought together in one firm Apple. Samsung adept at semiconductors and display technology integration as well as integration of customer-facing process (design, supply-chain and marketing) integrations. It is another firm that has excelled on several dimensions keeping cash registers pleasantly ringing across global markets. Lesson to note here is; a firm could attain exemplary performance if it strives to excel on all dimensions through consistent innovations. This increases hurdles that competitors have to clear to gain competitive advantage and therefore creates market positions that are more sustainable. Of course, companies need to maintain leadership in geographical markets. While Apple dominates in the West, Samsung has been able to hold on to Asian markets. Business Model Innovations require finding new and better ways of creating and extracting value. Uber and Airbnb “outsource” tangible assets (car and home ownership) and focus on managing relations with two types of customers (vendors and users of services) by investing in technology to enable relationship management. However, it appears everything does not always go in favour of Apple. During early second half of 2013, even though its operating income went up, the stock value of Apple came down. In the same period, Google had registered positive growth on both the metrics. At a broad level both the firms differ on product portfolio – one is a hard product based firm (i-Phone, i-Pad) and the other predominantly is a software (Android) and service based firm (search, ads). They both compete on OS. This seems to be a replay of the story in the mid-1990’s where it was Apple (Mac) versus Wintel and a very large number of PC manufacturers and hardware partners winning the war. Can Apple withstand attacks from Android and handset partners? Perhaps another weakness of Apple is over-reliance on i-Phone as a value-generator while Google is diversified across multiple markets. In any case, the valuation charts and ratios of both the firms have a different story to reveal (See Figure 3). As one can observe from the graph; Apple beats Google hands down on short-term, retrospective performance measures (ROA, ROE, and ROIC). However, when it comes to the long-run, forward-leaning valuation metrics (M/B, P/E, and P/CF), it looks like the market is placing greater faith in Google. Investors, while appreciating past performance, are fundamentally interested in future returns. Hence, firms should strive to create future value. When someone asked him how he scored so many goals, Wayne Douglas Gretzky, the famous Canadian Ice hockey player, nicknamed ‘The Great One’, is known to have replied, “I skate to where the puck is going to be, not where it has been”. Symbolically he stated; anticipate the future. In the business context; you have to be where the action is. Now the action is in the Asian markets and not in Europe or the US. So anticipate and learn from the future. Why lock up resources in Europe when the growth is in Asia? Additionally, it is easier to capture share in growing markets. Incumbents tend to protect their home turf when markets and margins are shrinking. Value creation in dynamic and competitive environments requires commitment of resources to help develop assets and investment in process management capabilities. Traditionally, these resources were reflected in tangible assets and financial capital. Successful companies were good in leveraging assets such as factories, capacity utilisation and asset turnover. However, if major assets are intangible, off-balance sheet possessions, and capabilities such as human capital, brands, distribution networks, business partnerships, or technology and intellectual property, how does one measure their effectiveness? For the S&P 500 companies, the Market-to-Book ratio hovers around 4:1, which translates to the fact that 25 percent of the value is visible on balance sheet and 75 percent of the assets like value of brand, value of customers, value of distribution networks, value of human capital and value of intellectual property rights etc., are missing on the balance sheet. These intangible assets are not being measured. As a firm if you nurture only the assets that appear on the balance sheet, it’s a sure way to invite trouble. Invariably, to compete in the global markets, the firm has to learn the art of managing off-balance sheet market based intangible assets. For instance, Mircrosoft’s customer base for its Office-Suite is the prime determinant for its off-balance sheet assets. Flipkart’s valuation is based on future earnings from the customer base served by affiliated vendors on its online platform with pay-on-delivery capabilities, two-wheeler based delivery boys (who are independent contractors) utilising warehousing networks and delivery/logistic capabilities. Most of these assets are not resident on the balance sheet. As the saying goes, if you cannot measure it, you cannot manage it. Or more succinctly, out of sight, out of mind. The value web among ecosystem members, and collaboration with competition, appears to be the new age paradigm. Two decades ago, in the early phase of its growth, Microsoft as a firm had actually collaborated with competitors to grow. Collaboration in the form of pre-installation by Dell, HP and the IBMs of the world had actually oriented Microsoft into a B2B firm. From this earlier avatar the company gradually evolved into a dominant B2C firm. In this direction, to increase the installed consumer base, MS-DOS users were migrated to Windows and also free samples of the OS were distributed. This in turn forced application developers to focus more on the Windows platform which owned a massive consumer base using the Windows OS. Interestingly however; competitors like Lotus 123, Novell were dragging Microsoft to court. But on the other hand, they were succumbing to market pressure and promoting their own software with the label; ‘Designed for Windows 95’. 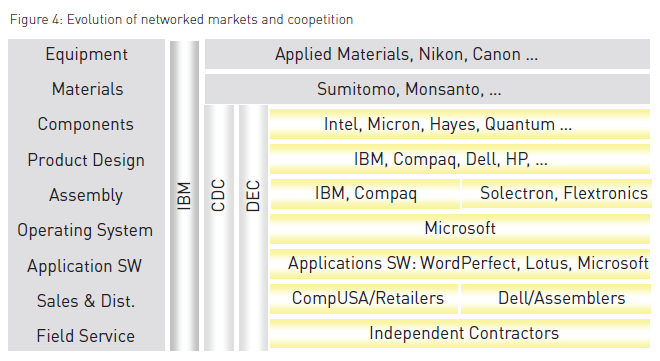 These firms realised that Microsoft had won the battle with market based asset – the consumer. “Isn’t it great people who hate you actually advertise for you.” Microsoft as a firm twisted the collaboration dimension in its favour as it had known how to nurture market-based assets. 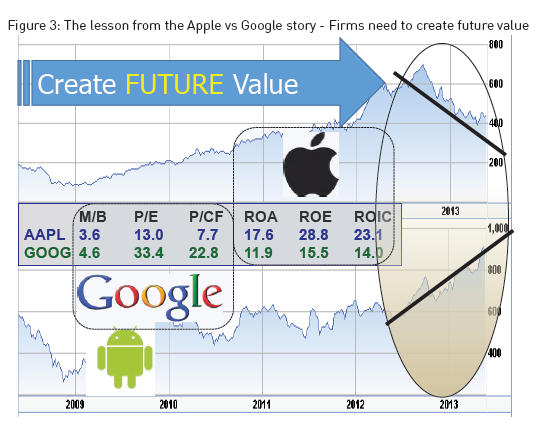 Competition between Google and Apple reiterates the same phenomenon. The consumer pull for Google Maps was so high that, within a month of discontinuing it, Apple had to revert to Google Maps replacing it’s own maps from the iPhone. Here the innovation was in realising and understanding ahead of competition about the importance of market-based assets like consumers. While much is spoken about Eco-Systems and Networked Economies, the phenomenon is not new. As shown in Figure 4 firms in the IT industry which were once vertically integrated now routinely cooperate and get horizontally integrated with each other. At industry level this phenomenon, referred to as coopetition, enables them to sustain and grow as “You can’t win on your own”. Ingraining an ‘organisational capability’ for innovation in creation of value is indispensable while competing in global markets. The basic questions underlying value creation are: who – which segments to serve (or not serve); what product or service to globalise; how to serve them through appropriate supply chains, channels and market-based assets, or organisational capabilities; and finally where (which geographical markets) to serve. Firms often over-simplify the world by believing that there can be universal truths and global strategies. Marketplace diversity exists across and within countries. Asian markets include developed ones (Japan, Korea, Singapore), emerging ones (China, India) and pre-emerging ones (Cambodia, Laos, Bangladesh). Within India and China there is a big difference across states and between rural and urban markets. Lesson 6: There is no such thing as Global Strategy – Build Ambidextrous Capabilities to Succeed. Brands as platforms aid growth and expansion. If your firm owns a strong brand it offers the luxury of timing the entry. Strong brands help to penetrate the market faster in short-cycle environments. In long-cycle markets, firms with strong brands and distribution networks can enter a market late and then accelerate by leveraging these market-based assets. With increasing investments in new product developments and reduced product development cycles and shrinking product life cycles (PLC), firms have less time to recoup all the investments. 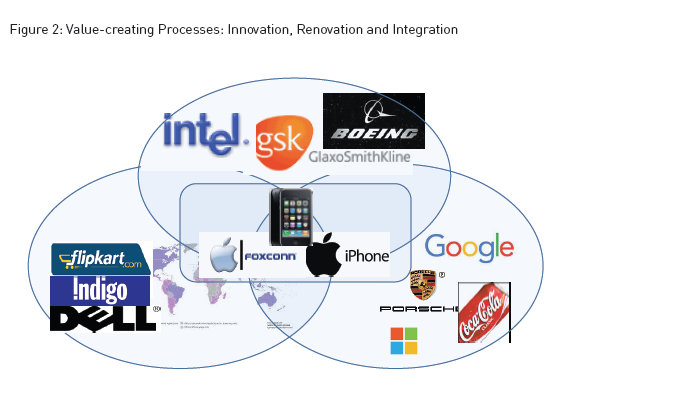 Global giants with increased power of vertical integration or value webs replicate innovation at a faster rate and alter the markets from being a long haul to short cycles, constraining margins and commoditising innovation. In such a scenario, firms need to develop ambidextrous capabilities. If you are in an industry where PLC is long like in Pharma (New Chemical Entities diffuse slow and are patented) the name of the game is to develop the capability of gaining higher market share in a shorter time (rapid market penetration as is done in the case of fashion and movie industries). At the same time technology firms where shorter life cycle are in vogue, planned product obsolesces are the order of the day; the name of the game is branding to gain loyal customer base. On an average the world is moving from longer-cycle to shorter cycles and tangible dimension to intangible dimension. To cope with differences in products and markets, companies need to tailor their business models to accommodate varying product and go-to-market strategies. This requires that firms apply different business models across the world (e.g., Pharmaceuticals, while employing high margin and lower volume models in developed markets, need higher volume lower margin models in developing markets). But, many large companies find it difficult to do so. 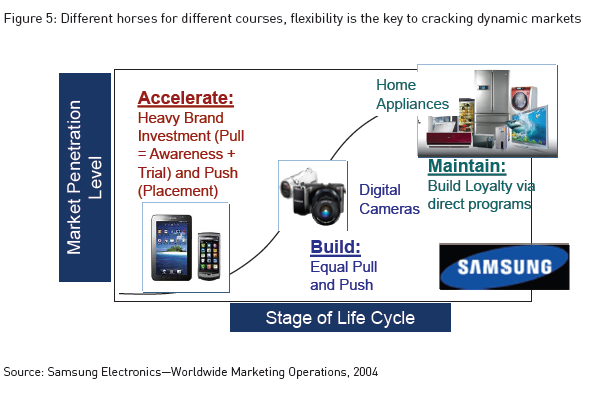 A company that has excelled in localising go-to-market strategies is Samsung which deploys “different horses for different courses” as illustrated in Figure 5. They employ market “acceleration” or “pull” strategies in new-product (and early-stage geographies) markets focusing on building the brand and market education. Market “maintenance” strategies are used in developed and mature product-markets. These focus on maintaining market share by focusing on trade-centered “push” strategies. In the growth phase an effort is made to balance push and pull strategies as the focus is on building both the size and share of the market. Samsung is meticulous in adjusting go-to-market strategies across both products and geographies dynamically. It is always hard – and expensive – to grow in mature, stable markets. Growing both organically and inorganically is always easier when conditions are ripe for consolidation in adverse, recessionary conditions, or when there are new openings in the marketplace say, due to technological disruptions or regulatory changes. The Indian e-commerce market, like any other market, had its own set of growth pangs. The conservative Indian consumer would pay only after physical inspection of the product. Conventional model of pay ahead – receive the product later did not auger well with several Indian consumers and the product off-take was limited due to this resistance in adoption. Flipkart initially copied Amazon’s e-retailing model but ran into resistance from the Indian consumer for whom seeing a product before purchase and the option of paying by cash instead of credit card was important. They pioneered the Cash on Delivery (COD) concept where money is collected in person after the delivery of the good. Further, warehouse infrastructure is severely underdeveloped in India. Delivery times were unusually high and decentralisation of warehousing would increase costs. Delay in gratification of the need also acted as a hindrance of product adoption. While implementing an Amazon-like model, Flipkart, unlike it’s counterpart Amazon, adjusted it’s go-to-market model and made appropriate changes in the order-delivery system, turned this disadvantage (higher costs due to the need to decentralise warehousing) into an advantage — via same day localised delivery. To overcome distribution bottle necks, the firm recruited approximately 40,000 local delivery agents who would deliver the goods on two wheelers. This innovation is applauded as it was a win-win proposition for the firm as well for unemployed Indian youth. Further, by out-sourcing delivery Flipkart reduced investment requirements thus improving performance metrics such as returns on assets (since asset requirements are lower). At the firm level, margins improved and at the economy level it groomed young entrepreneurs. It is anticipated that, with increasing participation of people in online shopping, the industry will continue to drive more employment opportunities and contribute towards creating more entrepreneurs through the e-commerce marketplace model. In many emerging markets such as wireless telecom and e-commerce, the absence of legacy systems to resist change has made it easier to “leap-frog” existing ways of doing business as there are more limited “sunk costs” delaying decision to adopt newer technology and processes. Value creation in dynamic and competitive environments requires commitment of resources to help develop assets and investment in process management capabilities. rest on product and process simplification and scale. Developed market companies from the west often enter at the higher end of the market. But, given the price elasticities in these markets they increasingly vie for an opportunity to modify their business model/ brands in Asian markets by trying to go down the price curve. At the same time EM companies counter by migrating to western markets and upgrade their, business models/brands to increase margins. Trading up of brands from Asia to West and Europe in some sense is feasible with appropriate investments in branding and marketing. But, trading down from Western and European Markets to Asian markets demand huge efficiencies that are difficult to obtain. Many developed market MNCs had already outsourced manufacturing and supply-chain processes to the lower-cost emerging market partners and reversing the trend requires re-investment in manufacturing assets. This is difficult but feasible. Announcing new expansion plans for India in late 2015, David Schoch, President, Ford Asia Pacific said, “With these latest investments, we are making rapid progress in our vision of driving innovation from India to the world”. He was echoing what a lot of other MNCs were planning while investing in emerging economies. By expanding manufacturing at the local site and developing cars with local parts, Ford has managed to position itself as a strong competitor to foreign brands in the East. Alternatively, they can invest to further innovate to protect their position against emerging market MNCs that are climbing up the price-quality ladder to increase their margins. Brands as platforms aid growth and expansion. If your firm owns a strong brand it offers the luxury of timing the entry. Strong brands help to penetrate the market faster in short-cycle environments. In long-cycle markets, firms with strong brands and distribution networks can enter a market late and then accelerate by leveraging these market-based assets. Innovation in emerging markets is no longer a story of cheap hands copying Western products. Thus in Japan’s case disruptive innovations were centered on developing unique production and distribution capabilities. But why did these innovations not happen in the US as well? 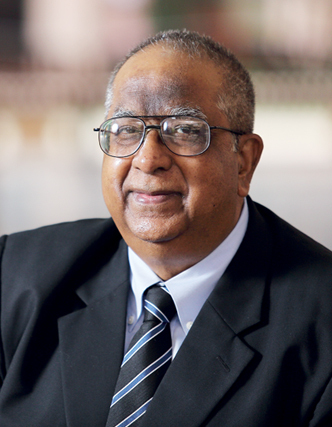 This was because an important precursor for success in emerging markets in which a preponderance of the population cannot afford as much as their more affluent western counterparts, was to come up with innovations in different areas of the business value chain and just not in technology. The value creating processes for targeting emerging markets might involve innovating in pricing and making the product affordable often through product and process simplification to take out cost. This has been the genesis of several industry level shifts in worldwide competition. Often, emerging market companies have challenged if not overtaken the traditional dominance of the west. Thus one of the keys to succeeding globally is to first succeed in their own backyards. General Electric has predominantly focused on technological innovations to create new products in the West. However the excitement in their health care laboratory in Bangalore is about the small affordable handheld ECG – the Mac 400 for Asian markets for just US $ 800. This device can reach hundreds of rural patients as it is easily carried in a backpack. GE understood that both markets required different products, different pricing and had different needs. Interestingly, the Indian ECG innovation has reached not only other developing markets but also the west – a form of reverse innovation. Simply “adapting” a product to emerging markets may not work if it does not fit its local milieu. A case in point is Britannia’s Nutrichoice biscuit. Conceptualised keeping in mind a ‘health with taste’ value proposition, it strove to capitalise on the nascent market segment of health-conscious and discerning consumers but faced a severe setback after its launch. While extensive research had gone into its contents and the exact market segment they were targeting, one simple aspect of consumer behaviour was overlooked. Most Indian tea drinkers liked to dip their biscuit in tea. However, Nutrichoice disintegrated when dipped in tea and had to be re-designed to withstand the dipping test before it emerged as a success. Each investment decision impacts the firm position in a specific geographic market on two dimensions; size and slice of the pie. The headquarters of North American and European firms unusually invest in their own domestic markets and fail to divert sufficient funds to emerging markets in EMs. Over investing in slower-growth developed markets and postponing entry decisions by a significant time lapse in more promising emerging markets results in global MNCs incurring huge opportunity costs. Apple by over-investing in North America and later Europe and failing to invest sufficiently in Asian markets resulted in forgone opportunities and higher later entry costs in Asia, costing the firm dearly in its attempts to gain share from incumbents such as Samsung. At the same time, Samsung which lost out in European and Western markets to Apple pre-empted the competition in Asian markets and ramped up its reach through franchised specialty stores. The important lesson is that the biggest risk is NOT taking risks to invest in market growth opportunities. At an individual level typically the capacity utilisation of a car (consider it as an asset) is roughly about 4% (assuming 30 minutes to work and 30 minutes to come back; translates to 1 hour out of 24 hours). The efficient capacity utilisation of the car is to maximise the asset utilisation through rentals; this proposition as an innovation leads to the development of a car rental service. Further moving a step ahead of the innovation curve, Uber had done away with asset ownership. Uber doesn’t own cars – the driver is the owner and s/he offers taxi service at a higher utilisation of the asset (remember even if you rent a car you are not driving all the time). The Uber model is not new. Marriot did the same thing 20 years ago by divesting real estate and in effect saying ‘we are not in the hotel ownership business, we are in the hotel management businesses’. Such innovations fall in the category of fixed cost minimisation model. At the core of an innovative enterprise is the desire to stay ahead of the game in creating value. Business Model Innovations (BMIs) create value to the customer and help extract value for the owner. As competitors copy ideas, differentiation and uniqueness and competitive advantages dissipate. Hence firms consistently innovate to grow and strengthen competitive position. These lead to changes in value-adding strategies and, consequently, business models. In this paper we have summarised a dozen lessons that shed light on how one might innovate in global markets. These revolve around four key dimensions for value creation and extraction – who, what, how and where. Further, if one revisits the meaning of innovation “doing things better” – on each of the three words (“doing” – “things”—“better”) there are innumerable avenues to innovate. It is a virtuous cycle albeit constrained by the time variable. The above outlined innovations are few and the scope to innovate further is left to the fruitful imagination of the strategist.